Just wanted to pass along a quick update from our big trip to NYC. If you haven’t been following the story, we’re here as a result of my winning recipe, Braised Lamb Shanks and Mushroom with Brown-braised Onions, which I entered into a contest sponsored by Bertolli, the company which produces delicious pasta sauces, olive oils, and fresh-tasting frozen meals. We arrived early yesterday afternoon and were greeted at the airport by a swanky Lexus towncar. Not a bad way to start the weekend. 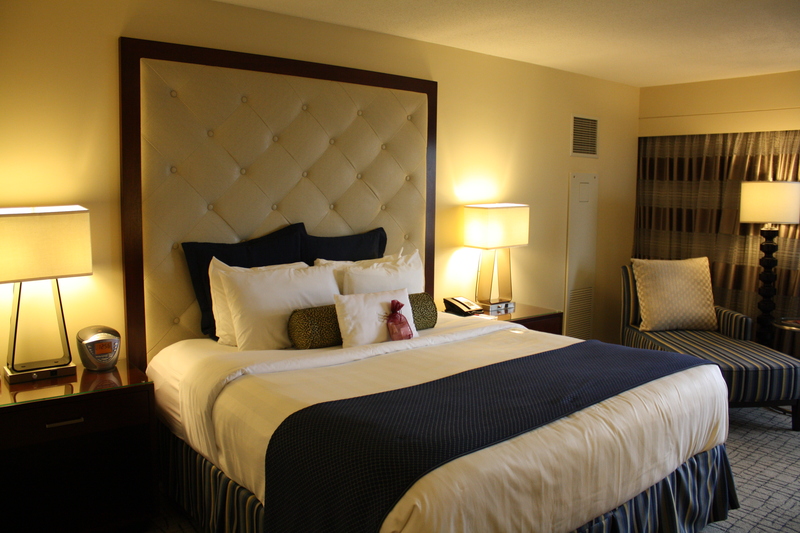 The driver got us into the city in a snap and we checked into our room on the 39th floor of the Crowne Plaza Times Square Hotel. 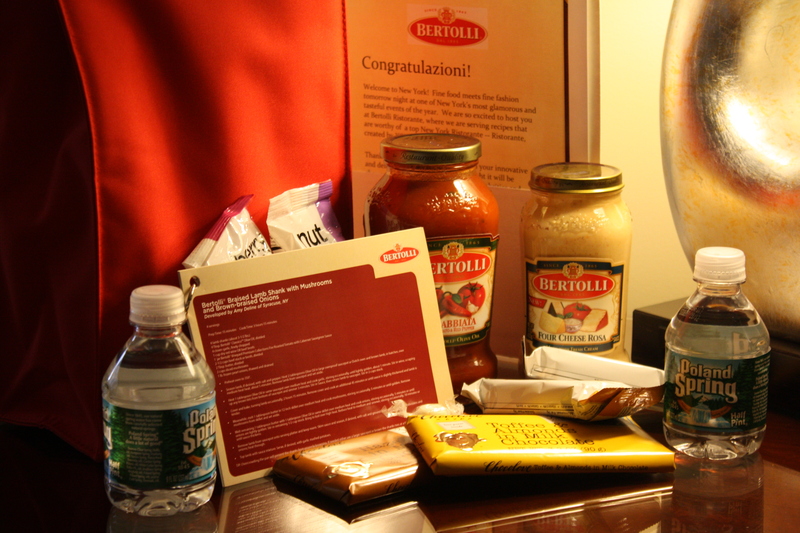 Within a few minutes of our arrival, there was a knock on the door, announcing the arrival of a welcome gift from the Bertolli team. The highlight of the gift was seeing my recipe printed on a glossy recipe card. By this point, it was well past our lunch time and my belly was burning with hunger. We set out in search of food, specifically Italian food, which my husband had a hankering for. We bypassed an Olive Garden and landed upon a little corner place called Ciro Trattoria. The placard in the front advertised a $15 Prix Fixe 3-course menu, with options such as Spaghetti and Meatballs, Chicken Marsala, or Rigatoni Bolognese. Sounded right up our alley, so we entered. Upon opening the front door, we were greeted by four uniformed police officers and a self-proclaimed psychotic who’d apparently just downed six Coronas and a Hennessey on the rocks in a thirty-minute time frame before deciding that she didn’t feel like paying. Ahh… good ole New York City. I sure did miss it here. The host ushered us to a comfortable table far removed from the commotion. We ordered our drinks and selected our entrées. Our meal began with a house salad, in a surprisingly delightful vinaigrette. 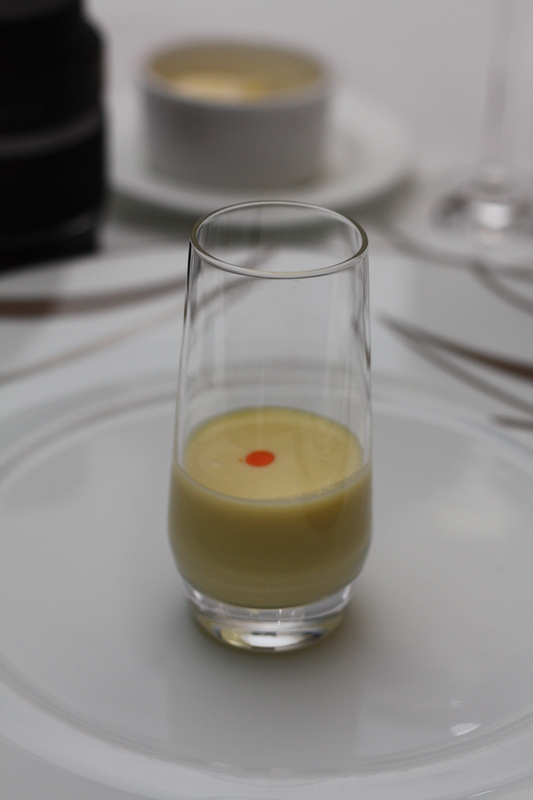 The sweetness of the dressing provided an excellent contrast to the saltiness of the olives in the dish. 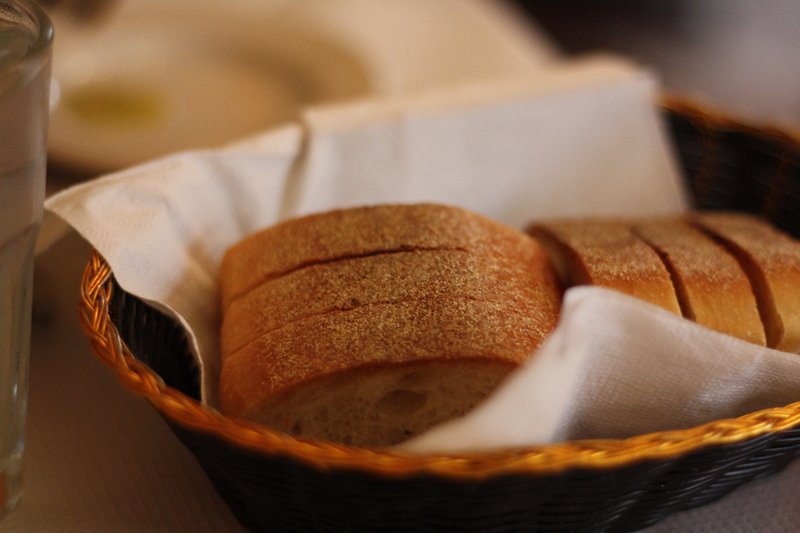 Italian bread was served warm, perfectly crispy on the outside, chewy in the middle. 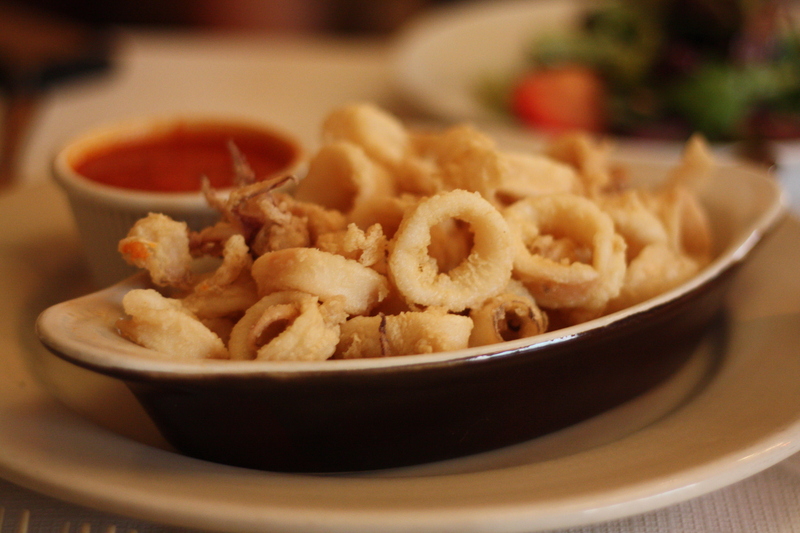 We shared an order of Fried Calamari, which were lightly seasoned and well-cooked. The sauce was unremarkable, but overall it was a pleasing dish. 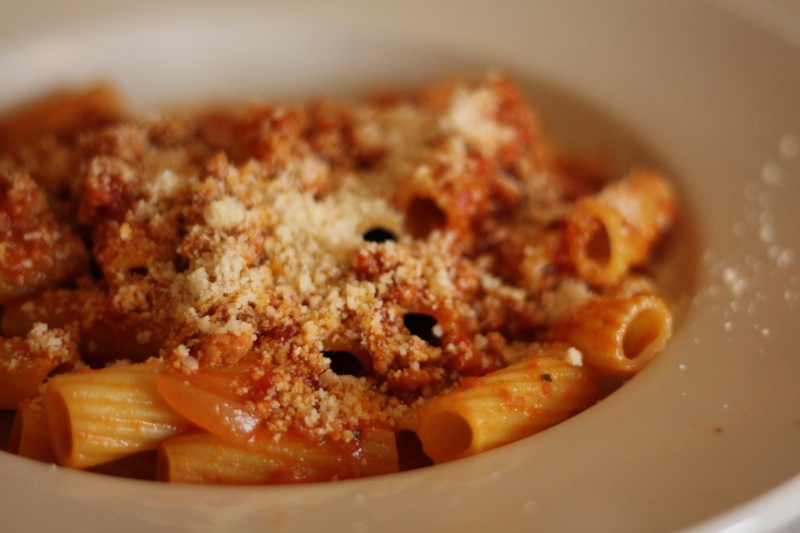 For my entrée, I selected the Rigatoni Bolognese. My husband had the Spaghetti and Meatballs. Once again, the sauce was somewhat unremarkable, but the pasta was cooked perfectly al dente and the parmesan cheese was particularly delicious. I had no trouble clearing my plate. 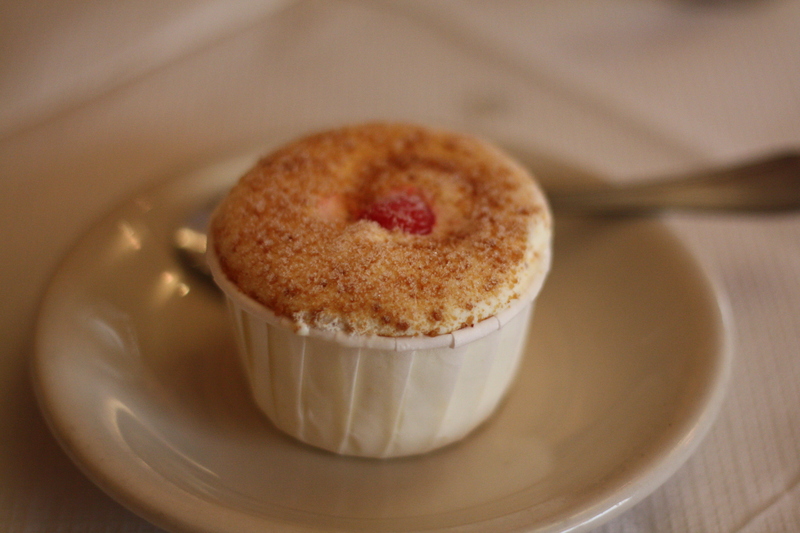 For dessert, they served Tortoni; a small ice cream dish topped with a light layer of ground nuts and a cherry. It was delicious. My only complaint is that is didn’t come with extra nut topping! By the time we left, the raving woman had been escorted out of the restaurant and was standing in the middle of the road yelling at the cars. We made our way past and headed back to the hotel for a much-needed nap. In the evening, we had the opportunity to meet up with the other contest winners and the Bertolli team at a welcome dinner, which was held in a private dining room at a Bryant Park restaurant called Aureole. What a truly lovely group of people! The drinks, conversation, and laughter flowed easily amongst this new group of friends. We even had the opportunity to meet an extraordinarily well-spoken and well mannered young man, who floored us with his knowledge of the culinary world. He also happens to be a skilled drummer, bassist, and pianist; a young Rock & Roll chef! He shares a food blog with his foodie mom, called The Mouths, which I will definitely be following! Dinner was truly impressive, prepared to perfection. 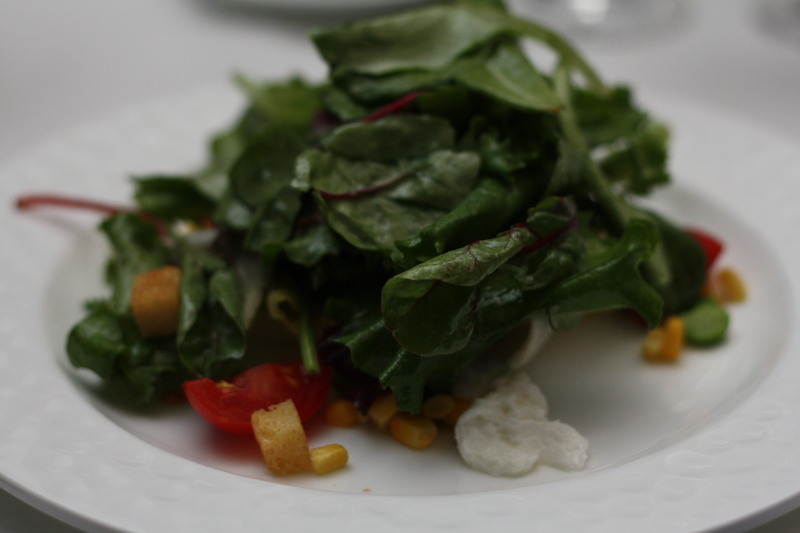 I started with the Organic Baby Greens with Fresh Buffalo Mozzarella, Summer Vegetables, and White Balsamic Vinaigrette. 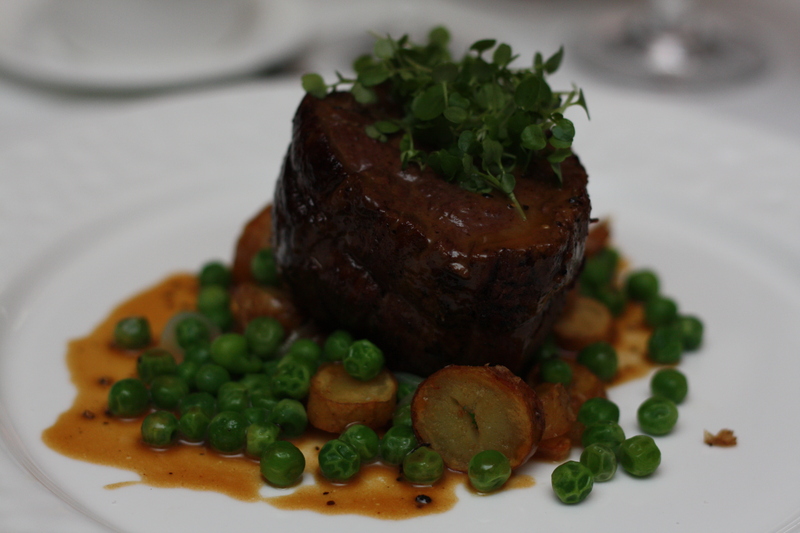 For my entrée, I selected the Beef Tenderloin with English Peas, Smoked Fingerling Potatoes, Pearl Onions, and Sauce Au Poivre. It was melt-in-your-mouth tender and expertly seasoned. 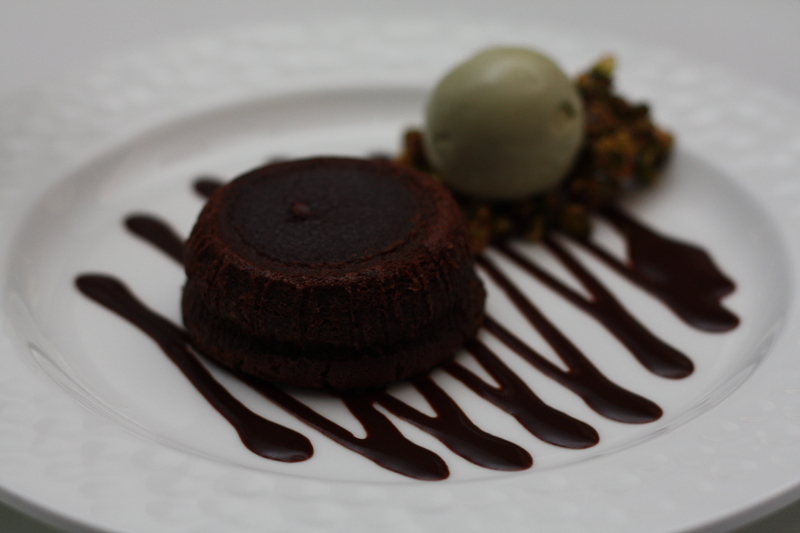 Dessert was a Warm Chocolate Cake served with Pistachio Ice Cream and Candied Pistachio. The flavor was full of rich, decadent chocolate, yet the texture was indescribably light. Chocolate heaven on a plate. It was a lovely dinner, which I felt honored to be part of. Tonight is the big event at Lincoln Center. I’m both incredibly excited and nervous. We’ll be attending the Zac Posen fashion show, followed by the Bertolli after party, hosted by Rocco Dispirito and Zac Posen. The winning dishes have been carefully scaled down into passed hors d’oeuvres and will be served to the attending celebrities and media. It’s certain to be an event unlike anything I’ve ever experienced. Posted in Food, General Rambling and Such and tagged aureole, bertolli, Cooking, Food, food photography, life, nyc fashion week, rocco dispirito, zac posen. Bookmark the permalink. Oh, it sounds like so much fun ! even the crazy lady. Ok, figure out out to make that cake and share ! Good Luck!! No matter what your a winner in our book. Good luck!! Great pictures in the post too, what fantastic food!